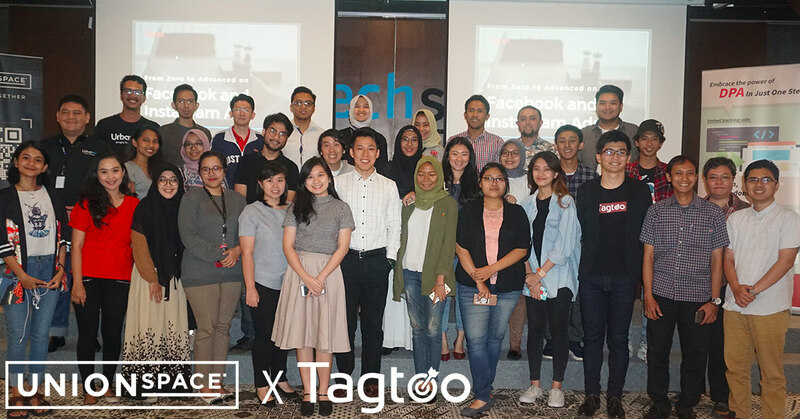 Following the previous Google Analytics workshop, Tagtoo collaborated with UnionSPACE and IDEC in September to present Tagtoo’s secret recipe for Facebook Ads and host an intense workshop for startups community and company representatives. The Facebook Ads workshop, entitled “From zero to advanced on Facebook and Instagram Ads”, was held in Satrio Tower, South Jakarta, a newly launched UnionSPACE community, where several companies, such as Fintech Indonesia, Pawoon, and DBS Digibank, have set their foot and stationed. “Tagtoo is a very amazing and reliable partner. We are more than excited to see Tagtoo bringing another awesome digital advertising workshop to our entrepreneur community,” shared Albert Got, co-founder of UnionSpace. Hosted by Edison Chen, Tagtoo business development manager and formerly ads optimization specialist, the workshop aimed at providing Indonesian entrepreneurs and small and medium enterprises with the correct advertising knowledge. Not limited to e-commerce only, there are over 40 companies and startups from different industries coming to join the event, including fintech companies, media platforms, integrated marketing providers, and etc. Moreover, several University of Indonesia students signed up for the workshop to prepare themselves for the coming entrepreneurial journey. The workshop covered the basic concept of Facebook Ads and advanced methodologies of Facebook Pixel with several cherrypicked case studies, guiding first-time advertisers to start first ad campaigns and advanced marketers to optimize in the right direction. For example, Facebook advertisers should separate ad campaigns based on different advertising platforms due to the fact that each platform posses divergent user behaviors. The bidding for ad delivery varies with user characteristics. Meanwhile, this workshop focused on the difference between Google Analytics, a commonly used tracking tool in the internet scene. Edison Chen’s personal hands-on experience on campaign optimization was also shared publicly. According to Edison Chen, the statistics on Facebook reporting is overestimated in most cases. Google analytics report, on the other hand, is often underestimated. Relying on any single report doesn’t give advertisers a clear picture of campaign performance. Before wrapping up the workshop, Edison Chen shared 6 precious tips that he wished he learned earlier on Facebook Ads — patience, efficiency, agility, focus, background, and perseverance. He indicated the aforementioned could significantly avoid unnecessary twists and turns in the learning journey for Facebook Ads beginners.